If you love YoVille's 'Luxury Thin Shelves', you'll love Crate & Barrel's 'Alcove Wall Shelf'! 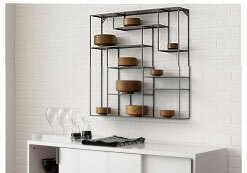 Nine sheet metal ledges suspend and intersect mondrian style on steel rods to frame objects of interest. Raw look with powdercoated finish. This discovery was sent in from one of our readers, Thank You, Joan!